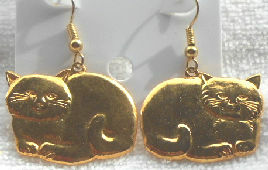 This pair of fish hook earrings features two very bright and shiny gold colored cats. Each cat is 1 1/8" wide x 7/8" high. Mark on the back says MEOW©. Previously owned but in good condition.